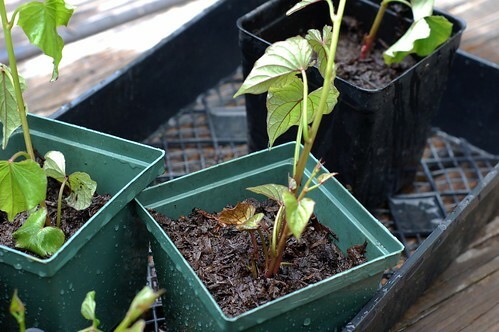 In case you missed the backstory, I am experimenting with attempting to use sweet potatoes to outcompete a crapload of Japanese Silvergrass and lemon balm that had completely taken over all the garden beds at our new house. You can catch up here if that's too vague for you. 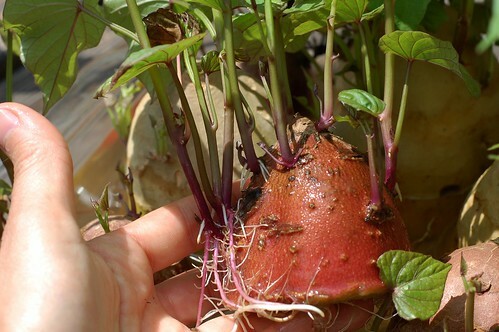 I've never grown sweet potatoes before but learned that most people buy their sweet potato slips (which is what the part that you plant is called) from seed suppliers. 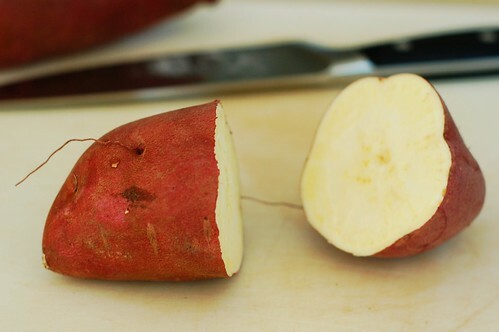 But I found a great post about growing your own sweet potatoes on Outlaw Garden so we're giving it a shot. 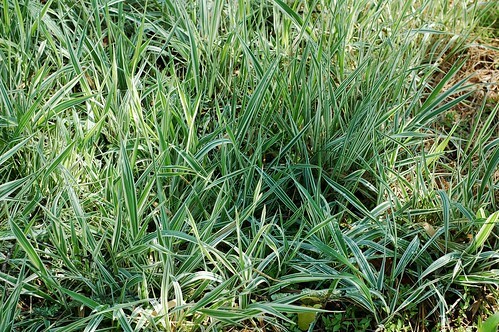 If it doesn't work, I'll order some slips once it's closer to planting time -- because they're tropical plants, they need the ground to be nice and warm before you can plant them - so we're looking at sometime in June. 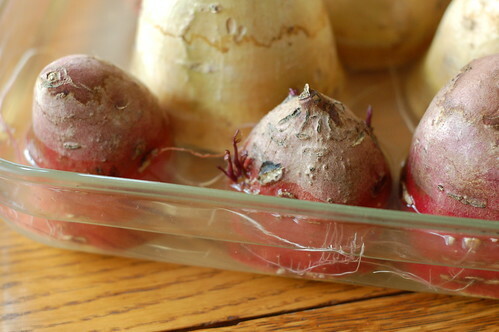 About a month ago, I bought some organic sweet potatoes at Sunflower, cut them in half and put them cut-side down in a Pyrex lasagna tray filled with water per Outlaw Garden's instructions. It was a bit slow at first but sure enough, thin white roots began snaking out from the cut ends submerged in the water. The roots multiplied and grew thicker and the tops began to send out tentative feelers that unfurled into lovely, delicate purple-veined leaves that fade to green as they grow. As the weather has warmed, they've started to take off, sending up shoots and lush, green leaves tipped with purple. It's been very fun to watch them grow and our five-year-old is following along with interest. After another couple weeks of growth, the first slips had sprouted roots from the bases of their leaves -- these are different from the roots that sprouted from the cut ends of the potatoes. This was the sign I'd been waiting for that they were ready to plant in small pots which should give them a chance to get even more established before they go into the ground in a few weeks or so. 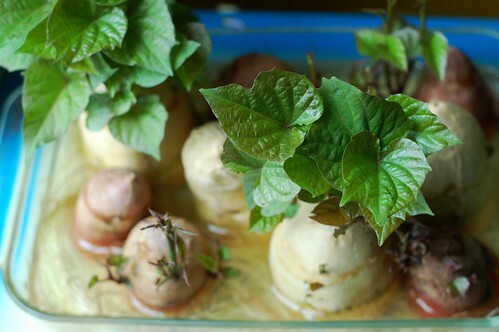 I cut the slips off and planted them in some mushroom dirt then put the potatoes back into the water so the other sprouts could continue to grow. 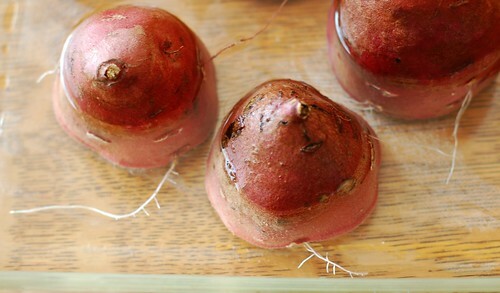 I'm still waiting for the yellow sweet potato shoots to sprout roots from the base of the slips - so far it's just been the purple skinned ones that made the move. 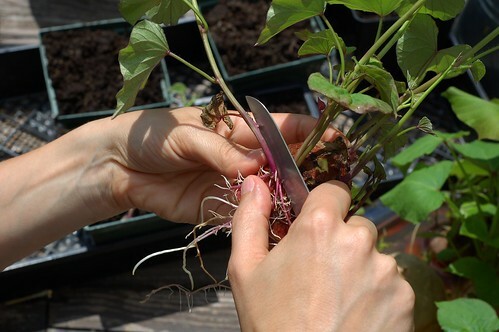 And more good news -- since sweet potatoes thrive in hot weather and warm soil, several of my trusted gardening sources (Maggie and Leila, I'm looking at you two) have recommended planting the slips in holes cut in either black plastic or cardboard. And, in case you hadn't noticed, I happen to have quite a lot of cardboard lying around these days... The hope is twofold: that the cardboard will help keep the heat-loving plants toasty and happy while also depriving the Japanese silvergrass, lemon balm and anything else we'd like to say goodbye to of life-giving sunlight. We shall see... I'll keep you posted. Part II: Sweet Potatoes Are In The Ground! Part III: Sweet Potato Harvest!! !